Combat odor-causing germs with convenient antimicrobial bird cage liners. Prevue Antimicrobial Cage Liner Paper boasts "Microbeguard" technology for fresher, cleaner bird cages. As seed waste, uneaten food, and bird droppings settle, conventional bird cage liners can become a breeding ground for odor-causing microorganisms. However, Prevue Antimicrobial Cage Liner Paper employs a coating of silver ions to disrupt microbe activity. Combined with regular cage cleaning, this antimicrobial technology inhibits growth of molds, mildews and bacteria on contact (on the treated surface only). 100% nontoxic and safe for both pets and humans. Antimicrobial protected bird cage liner paper is conveniently marked per inch for easy sizing and trimming. 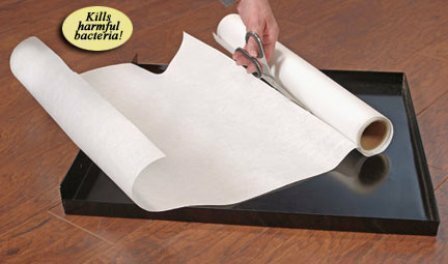 To custom fit any bird cage, simply cut the roll of heavy 40 lbs thickness paper to desired length.